If you think you have a work-based woodworm problem in the Bristol area, we can help you identify woodworm pests or apply treatment control solutions to remove your commercial woodworm problem. If left untreated, woodworm can seriously damage your Bristol property. During the larvae stages they eat through wood as they emerge from your house beams into adulthood. The eggs are laid in cracks around your home furniture, regardless of quality. The popular rough timber roof beam finish that so many buildings preserve is a prime spot for woodworm to lay eggs. Despite common belief, Bristol woodworm can be regularly found in new build commercial property as well as the more obvious older buildings. 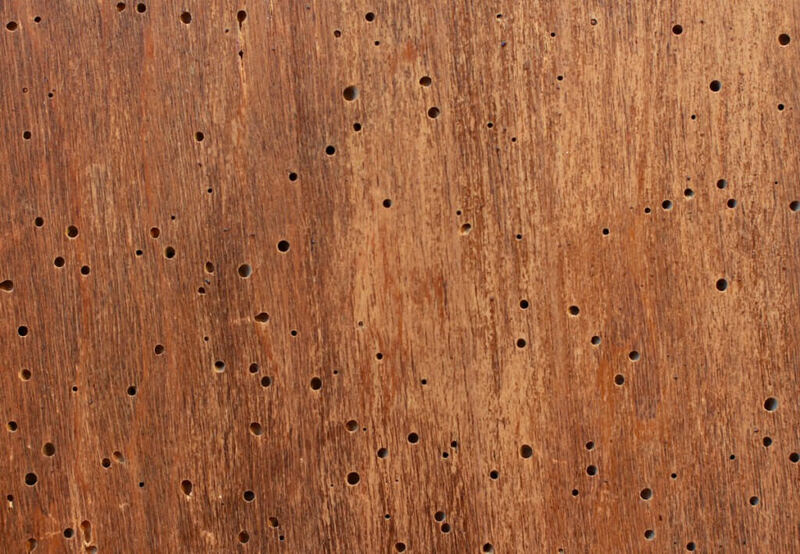 They leave clusters of nail sized holes in all types of wood around your home. Floorboards, structural beams and even your family furniture. Damage to these wood items often happens without the occupants being aware of the woodworm infestation. What can we do to prevent or control your woodworm pest problem around your workplace? We offer a professional woodworm property evaluation survey on your work space and then provide our Woodworm elimination proposal. Once assessed, a professional protection treatment will be made and sprayed across the infected areas. Catching the pest infestation early can significantly reduce structural damage to your Bristol commercial property. The treatment cost can vary significantly depending on the stage at which the woodworm infestation in your home has been tackled. We would provide a fully qualified surveyor to complete the full damage and cost assessment.